What if your cause doesn’t have many supporters? Smaller numbers have to take on more extreme tactics or make more outlandish claims in order to win the kind of attention that those large demonstrations on the Washington mall get. A handful of protesters milling on the mall won’t make news. Disruption does. So, the Westboro Baptist Church, of Topeka, Kansas, hit upon the idea of staging anti-gay demonstrations outside the funerals of soldiers, sailors, or marines killed in combat. The point wasn’t about the serviceman’s background (which church members never knew), so much as Pastor Fred Phelps vehement opposition to homosexuality. Small numbers disrupted the solemnity that normally attends funerals, and broke into news coverage by their sheer daring and outlandishness. This is hateful stuff. Ah, but it works. Think of lunatic Pastor Terry Jones’s threat to burn copies of the Koran–drawing attention to himself and his tiny congregation that he never could have attained with more conventional spiritual pursuits. Or think of the few individuals so opposed to the Vietnam war that they self-immolated near the White House. The smaller the numbers, the more dramatic the event has to be to get attention. The church’s lawyer, Phelps’ daughter, Margie, says the church holds the protests to make their point that U.S. deaths in Afghanistan and Iraq are punishment for Americans’ immorality, including tolerance of homosexuality and abortion, and therefore fall squarely under the protection of the First Amendment. The plaintiff, Albert Snyder, sued for damages because of the disruption at his son’s funeral. It’s not hard to imagine his grief and anger. 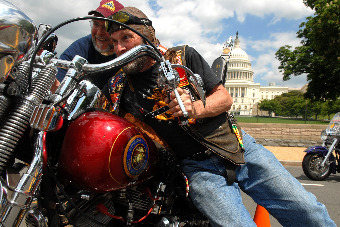 “There’s very few things on Earth louder than a V-Twin Harley Davidson,” said Dylan Waite, an Army first lieutenant and Patriot Guard volunteer who used his car alarm to contribute to the noise. This entry was posted in Uncategorized and tagged countermovements, gay, lesbian, tactics, Westboro. Bookmark the permalink. Can you define ‘works’? Is there evidence to suggest that this type of extreme tactic (attacking widely respected/revered targets to draw attention to an essentially unrelated issue) has been successful for Phelps (or any other less loathsome social movement using a similar tactic)? Interesting post! Small groups may use disruptive or abhorrent tactics to capture attention, but I’m also wondering whether they achieve any substantial gains beyond the news cycle. I’ve just been re-reading Lohmann’s informational cascade/signaling model. She would argue that the public will discount the participation of extremists & these groups are therefore unlikely to attract more supporters (and thus real influence) — at least unless/until moderates are drawn to their cause. This is a good reminder that disruption is sometimes a goal and that groups can actually strengthen their identities when they are thoroughly rejected by broader culture. I think that these actions are primarily designed to reinforce group identity and resolve. Public rejection of the Westboro members and their tactics confirms their belief that they are righteous and going to heaven, while the rest of us burn in hell. I find Phelps’s strategic shrewdness terrifying.